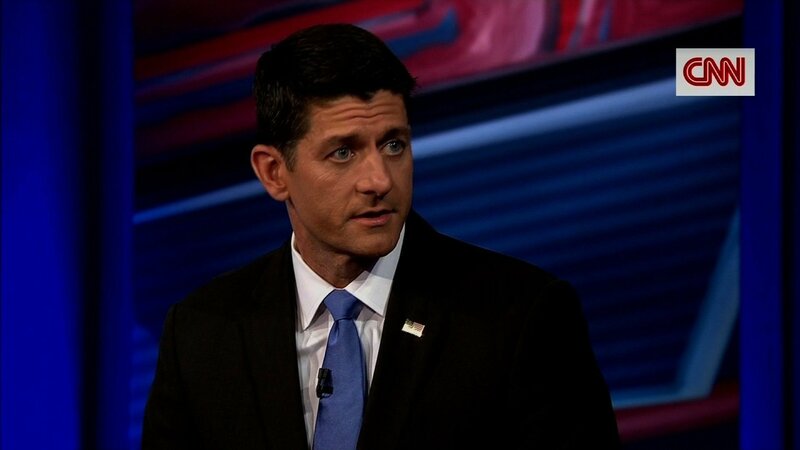 By Stephen Collinson CNN (CNN) -- House Speaker Paul Ryan on Tuesday defended his endorsement of Donald Trump -- despite his frequent differences with the presumptive GOP nominee -- saying the only alternative is giving the presidency to Hillary Clinton. "It is a binary choice," Ryan said at a CNN town hall hosted by Jake Tapper. "It is either Donald Trump or Hillary Clinton. You don't get a third option." But the challenge facing Ryan was clear when he was asked a question by Zachary Marcone, a Republican who said he couldn't support Trump because he is "openly racist." "Can you tell me, how can you morally justify your support for this kind of candidate?" Marcone asked.Ryan didn't address the premise of the question, reiterating his stance that opposing Trump amounts to supporting Clinton. He pledged to always speak his mind when he disagrees with Trump but argued that the best chance for conservatives to have their priorities signed into law is with the businessman in the White House and pointed to the ability of the next president to nominate Supreme Court justices.He was later asked by Kerry Cahill, the daughter of a man killed in the 2009 Fort Hood massacre, how he could support Trump after he called for a ban on Muslim immigration. Ryan was more direct on that question. "I disagree with him on it," Ryan said. "It's just that simple. "As he spoke of the next president's ability to choose Supreme Court nominees and influence the high court over the long term, Ryan criticized Ruth Bader Ginsburg. The 83-year-old justice is the subject of controversy after she told CNN this week that Trump is a "faker" who is driven by his ego. "I think it is out of place in an appointed branch of government. That shows bias to me," Ryan said. "I don't think that is something she should have done. "The speaker has one of the toughest jobs in politics right now: safeguarding the future of the Republican Party while simultaneously uniting the party around its controversial presumptive nominee. He is gearing up for the perilous political mission of guiding the GOP through next week's Republican National Convention.He pledged Tuesday to speak out and defend his principles whenever they diverge with those of Trump. "In the balance of things, the good clearly outweighs the things I don't agree with," Ryan said. "We don't have people who run for office who 100% reflect all of our views. It doesn't work like that. "The speaker has frequently been drawn into the center of controversy during the presidential campaign, sometimes scolding Trump or simply keeping his distance while also encouraging the party to support Trump to avoid a Clinton win in November. Ryan, for instance, repudiated Trump's attacks on an American-born judge of Mexican ancestry who is presiding over a civil suit against the billionaire. Ryan, who endorsed Trump in June, said those comments met the "textbook" definition of racism.The audience included Mark Hughes, a man who was pictured legally carrying a rifle on the night of the attacks that killed five police officers in Dallas last week. Police initially misidentified him as a suspect and his picture was posted on Twitter.Hughes, a Democrat, asked Ryan a question about improving health care for returning veterans who may have post-traumatic stress disorder and asked him what he would do to ensure guns did not get into the hands of people with mental disorders.Ryan said the House had just passed the first mental health legislation in a generation and said there was common ground between Republicans and Democrats on the issue. He also pledged that "we have got to clean up the VA" so that it could treat issues unique to veterans, including PTSD.Ryan deflected a question from audience member Steve Lonegan, a New Jersey Republican, who wants to incite a revolt to stop Trump from claiming the nomination. "It is not my job as chairman of the convention to tell the delegates how to run their convention," the speaker said.Ryan, the party's 2012 vice presidential nominee, had advice for Trump as he nears a decision on a running mate. "I would like a conservative," Ryan said, adding that Trump was "new" to Republican politics and had been on the different sides of many political issues.TM & Â© 2016 Cable News Network, Inc., a Time Warner Company. All rights reserved.